The Panasonic CU-2Z4TBE twin split outdoor unit air conditioner and heat pump. 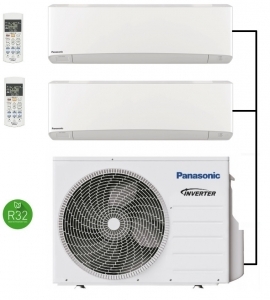 You can connect 2 indoor units of either 2kw, 2.5kw or 3.5kw rating from the Etherea wall mounted range to this outdoor unit (other types of indoor units can also be connected contact us for more information). Each indoor unit comes complete with a handheld remote control, you also have the option of the additional Wi-Fi module to control indoor units from a smartphone if required. This system is a full air source heat pump so can heat in the winter and cool in the summer as required; please see the brochure below for full details.